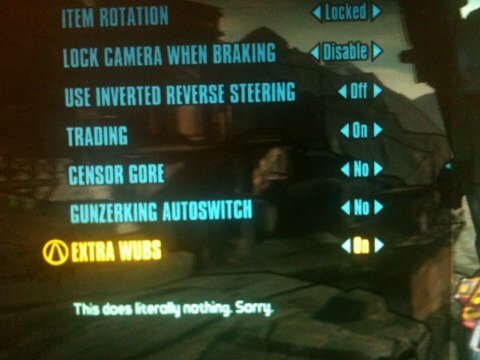 Borderlands 2 is filled with a number of interesting Easter eggs. Perhaps the most useless of these is the Extra Wubs mode that can be unlocked by the Konami Code. The Konami Code is a cheat featured in a vast number of games published by Konami. The most popular usage was in Contra, where the code gave you 30 lives. The code is as follows: Up, Up, Down, Down, Left, Right, Left, Right, B, A, Start. You have to enter it at the title screen of Borderlands 2 to use it. If you're playing on the PS3 or PC, press the crouch button and then jump button instead of B and A.
I was expecting Extra Wubs mode to bath the player in a constant stream of dubstep music, but alas. If you want to listen to dubstep, you'll just have to watch any video game trailer released in the last year.